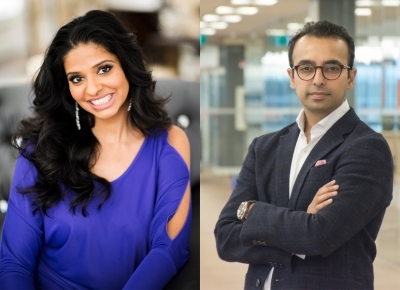 Two U of T Scarborough alum are now part of Canada’s Top 40 Under 40. Through a process of nominations, essays and interviews, Reetu Gupta (BBA, 2005) and Bilal Khan were selected from hundreds of candidates for their achievements in real estate and the IT/Tech sector. The Top 40 awards program, founded in 1995 by Caldwell Partners, recognizes 40 Canadians in the private, public and not-for-profit sectors who demonstrate outstanding success before the age of 40. “I felt so humbled and blessed knowing that even one person thought that I was eligible and capable to be part of this group,” says Gupta. Gupta, who graduated from the U of T Scarborough Bachelors of Business Administration (BBA) program in 2005, is the Chief Operating Officer of The Easton’s Group/The Gupta Group, a real estate business with head offices located in Markham, Ontario. She was one of nine women to appear on the list of 40 and the single representative of the real estate sector. Gupta is no stranger to leadership. At U of T Scarborough, she was involved in the South Asia Alliance Group (SAAG), first as a first year representative, then as Social Chair and by third year, vice president. Her leadership experience in SAAG and the BBA program helps her today. “In the BBA program you do a lot of group work – it’s always about delegating work and making sure everyone is contributing the right amount,” says Gupta. From 2000 to 2002, Khan, Founding Chief Executive Officer of scale-up innovation hub OneEleven, was working towards an Honours Bachelor of Arts (HBA) with minors in political science, economics for management and international development studies. Khan says he was “pretty lost” at the beginning of his undergraduate program. The events of September 11, 2001, set him on a new path of discovery. Khan says he went on a “pretty wild ride,” trying to understand what had happened, how it had happened and what role, if any, that he had to play in discussions moving forward. Vibrant debate and conversations on campus led him to question himself and his career aspirations in a way that ultimately led to enrolling in and graduating from law school. Today Khan, who served as Director of Policy and Senior Advisor to three consecutive Minister’s of Economic Development, is a fellow at the Munk School of Global Affairs and leads OneEleven in downtown Toronto. He was one of eight IT/Tech honourees in this year’s Top 40. “Being recognized in that particular vertical was amazing and incredible because it was a testament to my passion and my commitment to seeing Canada be the best place to live, work, raise your family and find the economic opportunities – no matter where you’re from in the world,” he says. When giving advice to young Canadian business leaders, Gupta and Khan say listening is an essential skill. “One of the best ways to move forward in life, in any situation, is to always take a moment to make sure that you’re listening to the other party and really absorbing what they’re saying and what they’re point is,” says Gupta. Khan says it’s important for every business student and leader to prioritize internal direction over external pressures. “I would recommend every student spend time looking in the mirror and reflect deeply on who you want to be and how U of T and the program you’re in can help you get there,” he says.